For our next party, Compound are proud to have two great friends join us for a night of warm music, smiling faces and great hugs. 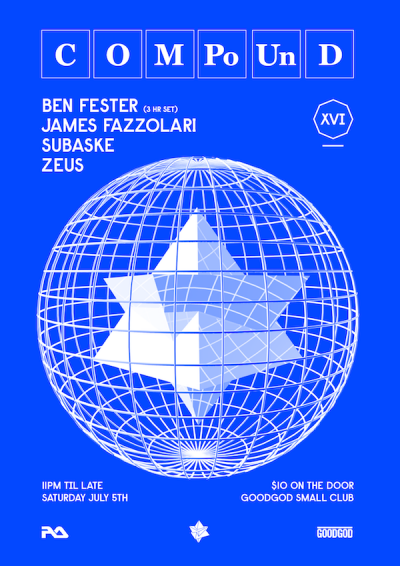 One of our favourite regulars Ben Fester will be playing an extended set joined by James Fazzolari who will be wearing the night in accompanied by Zeus and Subaske. Returning from our first party of the year, where he played a 3.5 hour back-to-back set with Zeus; Ben Fester will be spinning his favourite and most appropriate music for three hours. Having recently recorded a beautiful new Sunroom Mix, supporting internationals such as Kowton, Tessela, Prosumer, Phuture, Moritz Von Oswald, Even Tuell & DJ Fettburger and playing parties with DJs such as Preacha and Simon Caldwell over the past few months; we thought it would be great idea to have him play a three hour set in the danceteria. Wearing the night in will be James Fazzolari whose recent podcast for Chubby is easily one of our favourite mixes to date. His record collection spans from all varieties of club music and he has recently supported internationals such as Jef K and San Proper at the intimate Flyover venue. Ben and James will be accompanied by Zeus and Subaske who will be playing a back to back set full of music to provide that lovely transition to all out dancing territory.